When Franco Zeffirelli directs works written by others, whether Shakespeare (Romeo and Juliet, The Taming of the Shrew) or Verdi (La Traviata, Otello), he is reined in, to some extent at least, by the parameters set by the original scripts. What he brings to such properties is a flamboyant style and a massive indulgence in excess–a sort of camp sensibility, but lacking the irony or self-reflexive humor that can raise camp to a cerebral level. Zeffirelli’s first calling was and is as a designer and he remains a viscount of the visual, a sultan of spectacle who popularizes classics even as he raises the hackles of those who hold these works in intellectual esteem. In his years of directing opera for the stage, Zeffirelli worked frequently with the legendary soprano Maria Callas. 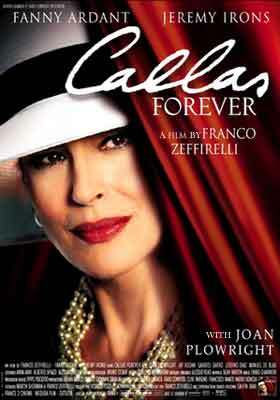 Based on a script that he co-wrote with Martin Sherman (The Roman Spring of Mrs. Stone), Callas Forever is Zeffirelli’s homage to the late singer. The film is a fiction intended to illuminate the character of Callas. It is so poorly realized that it satisfies neither as fantasy nor as character study. The premise is that a producer, Larry Kelly (a pony-tailed Jeremy Irons), an old friend of Callas’ (and presumably a surrogate for Zeffirelli), approaches her well after her retirement to suggest that they make a film of Carmen, a film in which Callas will lip-synch the role to the recording made in her prime singing years. Callas is shown as having gone into seclusion in her apartment in Paris, wallowing in self-pity, not to speak of alcohol and pills, over the loss of her voice (demonstrated in her last disastrous recital tour of Japan), as well as the loss of her love, Aristotle Onassis, who threw her over for Jackie Kennedy. After the expected initial resistance, Callas (Fanny Ardant) agrees, and emerges back into the world as the imperious diva, commanding crowds and press and adulation. Her swings from depression to high energy and back suggest that she might be bipolar, but that’s probably the result of shoddy screenwriting, not of literal intent. The making of the film within the film gives Zeffirelli the opportunity to stage extensive footage of scenes from Carmen, using the Callas recordings with Ardant lip-synching skillfully. But after the film is completed and a triumph is expected on all sides, Callas urges Kelly not to release the film, asserting that it is a fake which would besmirch her integrity. Kelly reluctantly agrees, but his imagined respect for Callas’ integrity has not been matched by the real (and contradictory) disrespect that Zeffirelli has shown in making a film based on that very conceit–laden with lip-synched scenes which his own script acknowledges would be offensive to the star that he purports to honor and call friend. It’s a breathtaking act of betrayal and hypocrisy, of self-aggrandizement and simple bad taste, to the detriment of a "friend" no longer able to defend herself. There’s a superfluous subplot around Kelly’s affair with Michael (Jay Rodan), a young artist from Cape Town, notable only for a scene is which Kelly brings Callas to see Michael’s paintings inspired by the singer’s recordings. The paintings are of the sort most often painted on black velvet and the real Callas surely would have been appalled. And, for all his doting display of any number of other Rafaelesque young men in the film, Zeffirelli seems to retain a timorous, 1950’s reticence about homoeroticism. Whether Zeffirelli or Sherman is responsible for the dialogue, it is a stilted string of cliches, reflecting the humorless and pallid sentimentality so typical of Zeffirelli’s tone. There’s no Shakespeare or Boito to provide the words and irony and structure that are dismally absent and desperately needed here. Zeffirelli is not beyond appropriating the great scene from Jonathan Demme’s Philadelphia in which Tom Hanks does an explication of the great aria "La Momma Morta." In Callas Forever, Zeffirelli attempts to accomplish the same for an aria from Tosca, but fails to convey for Puccini the profound dramatic effect that Demme achieved.for Giordano. Radiant Fanny Ardant (Eight Women, Ridicule) manages to float above this sticky morass looking glamorous and elegantly fashionable (lots of Chanel), and somehow sustaining the ultimate dignity of Madame Callas. Veteran Joan Plowright does her best to make something of the role of another Callas friend, a journalist, but is provided no material worthy of her skills.